Essilor focuses its efforts on vision at arm’s length. 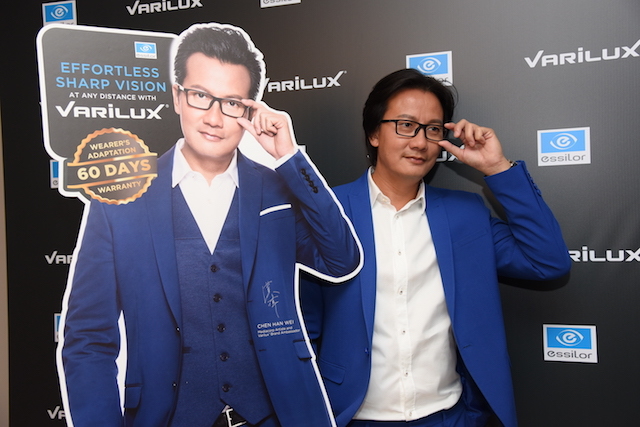 Varilux’s brand ambassador, Chen Hanwei. Presbyopia is caused by the natural ageing process of the eye that many people will begin to experience when they are close to 40 years of age, with statistics from 2015 estimating that more than 1.1 billion people worldwide are affected by this condition. Also known as the age-related loss of clear near-vision, presbyopia causes blurred vision at near distances, affecting the quality of life in fundamental daily activities such as using the smartphone or reading. Given our dependency on good near-vision for our everyday tasks, presbyopia is very much a significant problem in life. In addition, in our digital-focused lives that we lead today, this has given rise to different vision habits with the constant shift of near-vision view between the smartphone, laptop, tablet, and hardcopy print materials. With this all in mind, Essilor has launched its Varilux X Series, a new premium progressive lens, which addresses the main limit of other progressive lenses – the need to adjust their heads or arms to have clear and sharp multiple near distance views. According to the company, this latest technology provides a 75-percent match with wearers’ visual needs and a significant improvement of 59 percent on average compared to other premium progressive lens. Customers selecting Varilux X Series may also opt for further personalisation via Near Vision Behaviour (NVB), a new in-store personalisation tool to get patient’s measurements. NVB is a new and simple measure that takes into account a wearer’s behaviour and posture while replicating a key and familiar activity at near, so that their own vision area is positioned and shaped where and how they need it. This new first level of personalisation will provide reliable and robust measurements of the wearer’s near-vision. Recognising that adapting to a new set of prescriptive eyewear may take time and require multiple adjustments, customers also enjoy a 60-day warranty to allow them to adapt to their customised Essilor prescriptive lens. Varilux X Series is available at major optical shops throughout Singapore.